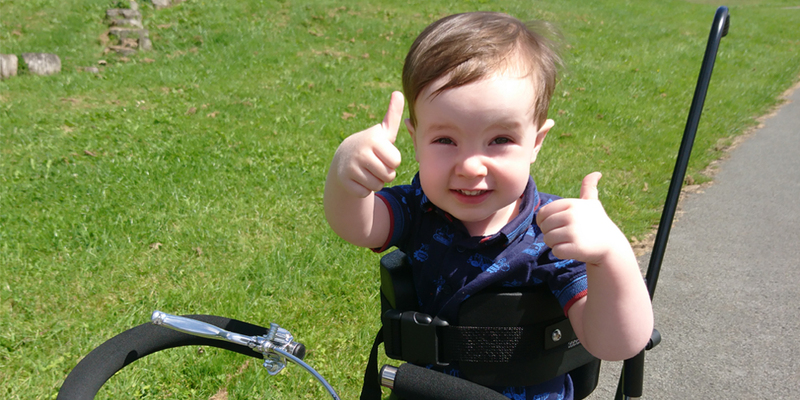 Aaron gives his new trike two thumbs up! You are here: HomeOur ImpactMobility Success StoriesAaron gives his new trike two thumbs up! Aaron is a 2-year-old boy from Liverpool. He likes watching Mr Tumble, singing nursery rhymes, communicating using Makaton signs and reading books. Aaron loves being outdoors and really enjoys going to playgroup. Aaron and his family live very close to a country park and love going regularly to see the horses and play in the playground. Yet Aaron has complex needs and has very weak muscles, hypermobility and his speech and motor development are significantly delayed. His disability affects his daily life as he is very unsteady on his feet. my AFK funded a tricycle recommended by his physiotherapist to help build his strength. Aaron was very happy when he got his new trike! Help other disabled children and young people like Aaron by viewing our current appeals.